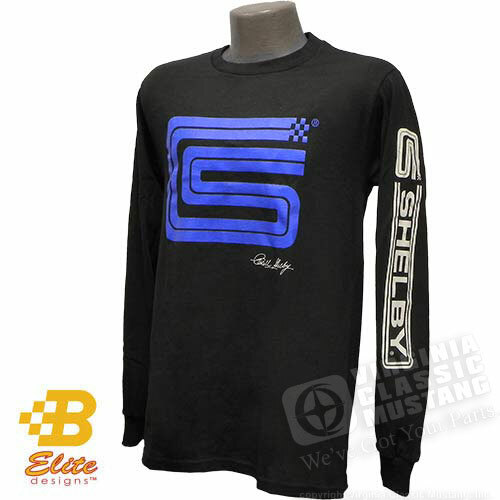 Carroll Shelby CS Logo Black Long Sleeve T-Shirt. We now have a few really cool new T-Shirts and a Hooded Sweatshirt with the Shelby and CS Logos. 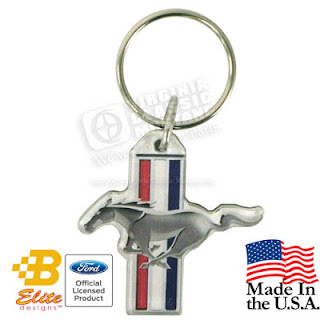 They are all very nice quality shirts and, of course, are Carroll Shelby Officially Licensed Products. 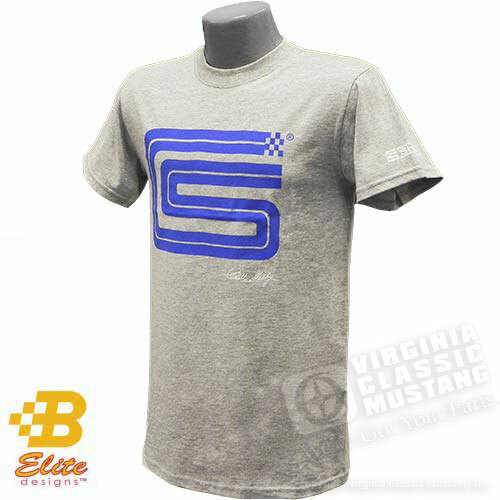 Carroll Shelby CS Logo Grey Short Sleeve T-Shirt. 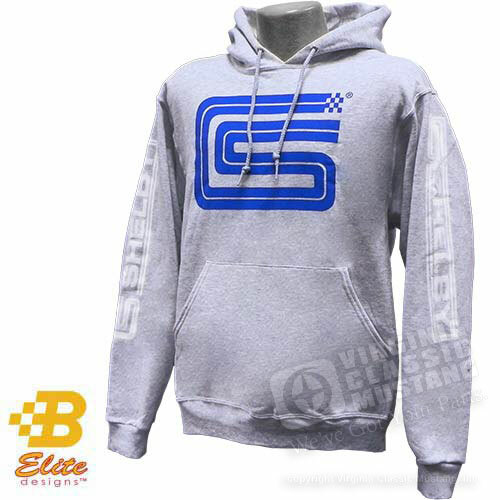 Carroll Shelby CS Logo Grey Hooded Sweatshirt. This lift allows the Mustang door to be installed by a single person. Jeremy at Maple Hill Restoration continues to assemble his beautiful Twilight Turquoise '65 Mustang Convertible. Here are some more pictures he has shared with us. Be sure to keep reading, because we will have full details on the windshield installation soon. Like us on Facebook or subscribe to our Blog (on the right side of this page) for regular updates. The Mustang's front bottom window glass channels have been zinc plated and are ready for the glass. The Mustang's quarter window track mechanisms have been zinc plated. The Mustang's parking brake handle assembly is plated, painted, detailed and ready to go! Detail on the Mustang pedal assembly. Detail on the '65 Mustang Dash. Under Dash / Pedal Detail on the Mustang. 1965 Mustang Restoration. Driver's door is installed! Front Window Regulator and scissors assembly ready to install. Mustang quarter window regulator ready to install. Image of the front roll around support on the Mustang. Front portion of the Mustang well liner installed. Padding installed (duplicating the original) on the flat section of the top on the convertible inner wheel house. We now have three styles of Mustang and Shelby logo hats. They are brand new and just arrived in stock. The American Bred cap is our part number AC-242. 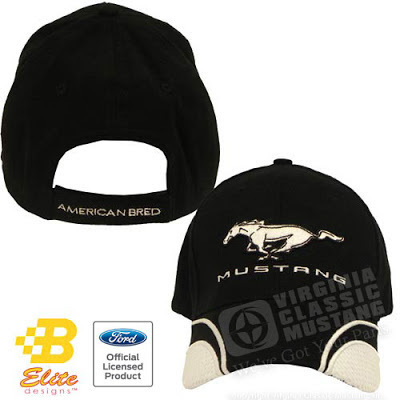 It is a black cap with a raised embroidered Mustang Pony / Running Horse. The other new cap is an "old school" hat with a mesh back. 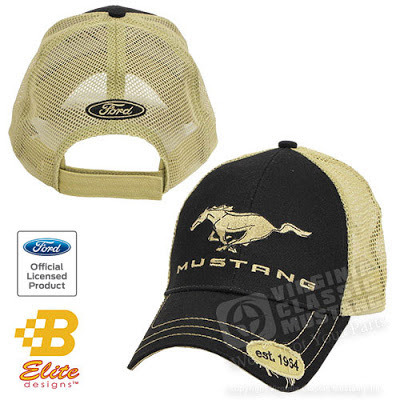 It is black and tan and features an embroidered Pony, the word Mustang and a "est. 1964" patch on the brim. There is also a Ford oval patch on the back. Our part number is AC-243. 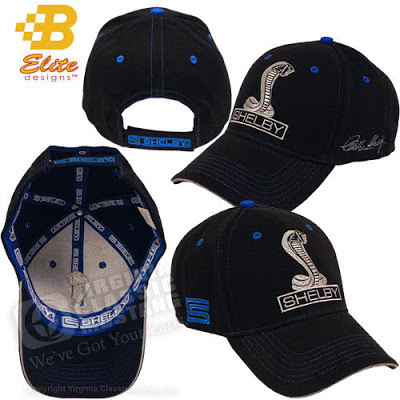 We also have a Carroll Shelby Signature Hat with an embroidered Shelby Snake emblem on the front, Carroll Shelby signature on the side, CS logo on the other side, and a Shelby logo on the back adjustable strap. Our part number is AC-244. Our Yellow Top Ford Ignition Coils have been improved again and are now in stock again! It's probably been a year since we have actually had these great Yellow Top Ford Ignition Coils in stock. Another functional upgrade has been made, and they have just been trickling in. We were just able to fill a orders on a first come, first served basis. Well, we just got enough of the coils in to take care of all of our customers that have been patiently waiting, and we have a quantity in stock! 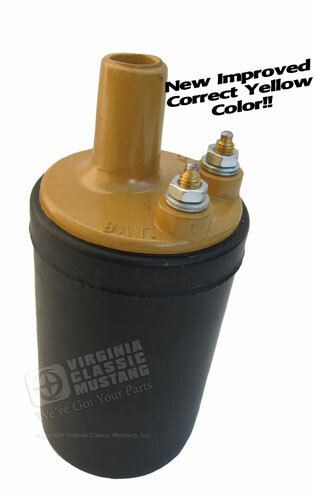 Another improvement has just been made to these Yellow Top Coils for your classic Mustang. The yellow is now just like the original. Correct yellow top made just like the original-not just painted to match. Each one is performance tested on special testing equipment before final packaging. These are a huge improvement over the coils that have been on the market. These yellow top ignition coils not only fit Mustangs, but they were originally installed on almost all models of Fords - 6 Cylinder and V8 models. By the way, don't forget to "like us" on Facebook to receive these Blog posts along with other pictures, videos and cool Mustang information!! Close up of our Yellow Top Ford Ignition Coil. 1965 Twilight Turquoise Mustang Convertible. Today, we have even more images of the Twilight Turquoise '65 Mustang Convertible at Maple Hill Restoration (www.MapleHillResto.com). Original markings on the lower area of the radiator support were duplicated on the Mustang. Splash Shield installed. Sprayable seam sealer will be applied after more assembly as originally done on the Mustangs. Area above the rear end housing on the Mustang. Mustang Fuel Tank is installed. Detail includes an original "C4... FoMoCo" marking fuel sending unit. The same rotation number that was found on the lower radiator support reinforcement was also found behind the Mustang's rear bumper. More Mustang rear area (underside) detail. This is originally a 6 cylinder equipped Mustang, so this rear end rubber bumper was originally installed. The paint drips on the floor were duplicated and look super nice. Rear frame area detail was duplicated. Here you can see the galvanized area where the Mustang was bolted down on the assembly line. Mustang cowl area detail. Nice! This image shows the flattened rear wheel housing that is unique to the convertibles. The flattened section is necessary to accommodate the Mustang folding convertible top. Front shot of the '65 Mustang Convertible. Lord Fusor # 805 Sprayable Seam Sealer applied with the proper gun duplicates the original sealer. As we publish all of these images of Mustang restorations, we get a ton of questions. We don't mind! Keep them coming! Anyway, one of the common questions concerns the duplication of the sealer that is found in the front and rear wheel areas and the inside of the rear quarter panels. Jeremy at Maple Hill Restorations (www.MapleHillResto.com) shared his expertise by showing us what material he uses and the gun that is used to spray it. As shown, he currently uses the Lord Fusor product # 805. This material must to applied with the special spray guy shown above. This is the result sprayed and then painted on the inside of the Mustang rear quarter panel. This is the result sprayed and then painted on the inside of the Mustang rear wheel well area. 1965 Mustang Convertible. Twilight Turquoise. We have some more images of Jeremy Turner's (www.MapleHillResto.com) 1965 Mustang Convertible. Wow! When it starts coming together like this, it makes all that work worth it! The detailed brake and clutch pedal assembly looks great with the proper detail. Nothing is being overlooked. Jeremy even found an older NOS Brake Light Switch with the over FoMoCo script for the Mustang. The original master cylinder has been restored and is being used. Detail on the master cylinder showing the date. Some under hood / engine compartment pieces have been installed on this 6 cylinder Mustang. More incredible detail on the Mustang drum brake master cylinder. Jeremy duplicated the original paint procedure detail with the plugs in the holes and the cap on when the master cylinder was painted black. 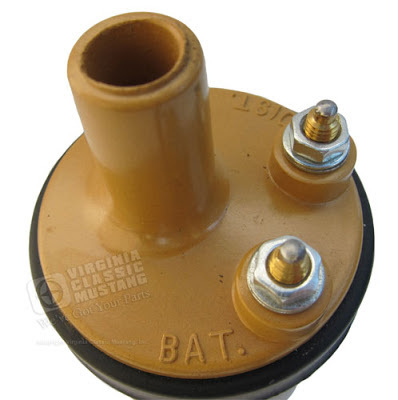 Original cooper master cylinder cap as originally installed on this Mustang was used. More Mustang Brake Master Cylinder Detail. Starter Solenoid and some wiring is now installed on the Mustang. The original detail on the Mustang idler arm has been masterfully duplicated here. More Mustang Wiring detail along with the hole used for the factory air conditioning. Just some more amazing detail on this Mustang! A look at the Mustang Brake and Clutch Pedal Assembly from under the dash.